What does it mean to give grace? Grace is probably one of the hardest things to grasp. Perhaps because it’s so uncommon in our daily lives. But if you’ve been a recipient of grace, you know how to be a giver too. In marriage (as in daily life), I find it hard to be the one who gives grace. But I do know how to receive it. I receive grace when I’ve been rude to the husband, or nonchalant in my attitude, and he takes it in his stride. I receive grace when I forget to put the phone down and ask him about his day. Yet he doesn’t grumble or nag at me. I see grace when I’m feeling lousy but he accepts me as I am, weaknesses and all. I see grace when he lets me vent my frustrations, and doesn’t shut me out. I see grace when after I’ve lost it and yelled at the kids, he doesn’t put me on a guilt trip, and sits down and troubleshoots with me instead. And whenever I receive grace, I’m better able to spread some around, even to the kids. But then, what if we take grace for granted? (It’s easy to, isn’t it?) What if they push it further? I could choose to bully my husband and take advantage when he’s in grace mode. But somehow I don’t. 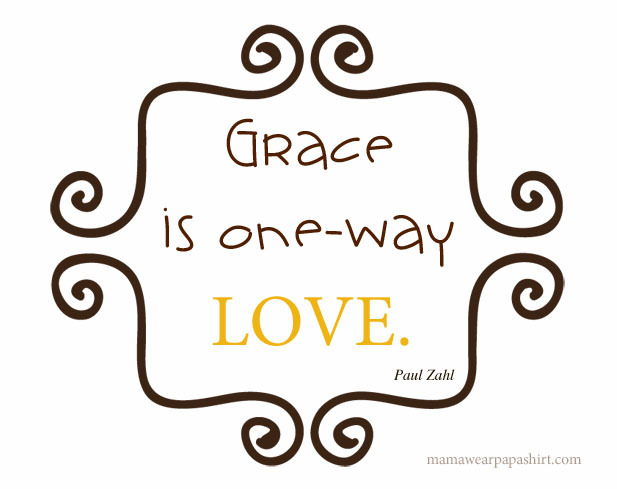 If grace is one-way love, then I must say it usually gets a reciprocal effect. It gives back. If grace is all about the giver, I feel propelled to want to be a giver too. Because when I accept the grace that he’s offered with his open hands, I feel unworthy, almost indebted. Also, I’m reminded that the biggest grace of all, is the one when Christ paid for my sins by dying on the cross. I can’t even begin to repay that debt. What I can do though is to offer the same grace to others who need it as much as I do.